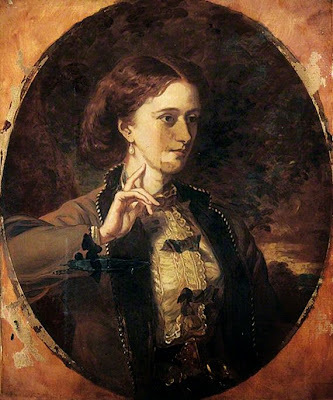 My choice of works of art to meditate on this Lenten morning [9 April 2014] is two portraits of the Hon Emily Charlotte Meynell Ingram (1840-1904), one by Francis Grant, and a second portrait by Sir William Blake Richmond. The portrait painted by Francis Grant. It was painted ca 1867 in oil on canvas, and measures 77 x 63.5 cm. In 1993, it was bought from Lord Halifax, with the assistance of the National Heritage Memorial Fund and the National Art Collections Fund. It is now held by the Leeds Museums and Galleries and can be seen Temple Newsam, Leeds. The Scottish artist Francis Grant (1803-1878) was born in Edinburgh, but worked mainly in England. He was one of the most successful fashionable portraitists of his day and he produced sporting pictures and fox-hunting scenes. He was a president of the Royal Academy, and died in Melton Mowbray, Leicestershire, on 5 October 1878. Emily Charlotte Meynell Ingram (née Wood) of Hoar Cross Hall is best remembered for building the Church the Holy Angels at Hoar Cross, 11 km west of Burton on Trent and about 12 km north of Lichfield. 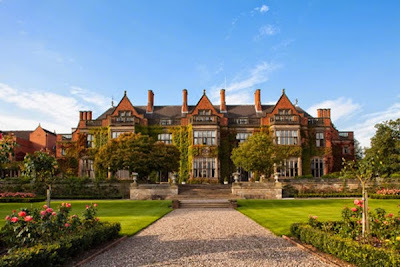 Hoar Cross Hall had once been the home of the Talbot family, Earls of Shrewsbury, and the historian John Ashdown-Hill suggests Lady Barbara Talbot of Hoar Cross Hall was the owner of the Bosworth Crucifix before it eventually passed through the Brown and Carter families to the Comerford family. In 1780, she married Francis Fortescue-Turville of Husbands Bosworth; she was a sister of Charles Talbot (1753-1827), 15th Earl of Shrewsbury (1787-1827), and aunt of John Talbot (1791–1852), 16th Earl of Shrewsbury (1827-1852) and patron of the Gothic revival architect AWM Pugin. In 1794, Hoar Cross Hall was bought from Barbara’s brother, the 15th Earl of Shrewsbury, by Hugo Meynell (1759-1800), who wanted the 8,800 acre estate for its hunting and shooting amenities. With his marriage to Elizabeth Ingram Shepheard, the Meynell family inherited the Ingram estates in Lincolnshire. His son, Hugo Charles Meynell Ingram (1783-1869), took the Ingram name in 1841 when he inherited Temple Newsam near Leeds, and began rebuilding Hoar Cross Hall in 1862. His son, Hugo Francis Meynell Ingram (1822-1871), was Conservative MP for Staffordshire West (1868-1871), and inherited and Hoar Cross Hall and Temple Newsam in 1869. On 11 August 1863, Hugo married Emily Charlotte Wood, daughter of Charles Wood, 1st Viscount Halifax. The Revd Michael Fisher, in Staffordshire and the Gothic Revival (Ashbourne, 2006), describes this as “a love match” … but “a strange one.” Hugo was 20 years older than Emily; he was a Tory, and she was a Liberal; his interesting were mainly in hunting, shooting and fishing, while Emily was a talented water-colour artist with a deep and pious Anglican faith expressed in her Anglo-Catholicism. Emily shared many of the religious and theological values and outlooks of her brother the Anglo-Catholic Charles Wood (1839-1934), 2nd Viscount Halifax. He was President of the English Church Union, and played a prominent role in the early attempts to bring about dialogue between Anglicans and the Roman Catholic Church. Later, he was one of the initiators of the Malines conversations (1921-1927), involving Cardinal Mercier, Bishop Charles Gore, and others. One of his last achievements was the union of the English Church Union with the Anglo-Catholic Congress in 1933. Hugo continued rebuilding Hoar Cross, which was redesigned in the Jacobean style of Temple Newsam by Henry Clutton (1819-1895). Today the features of Hoar Hall include a symmetrical garden front with three canted bays, three gables, and large mullioned and transomed windows. Hugo was in charge of the Meynell Hunt. As the Sudbury Hunt, it can be traced back to 1793. When the Meynell family took over the hounds in 1813, the name was changed from the Sudbury Hunt to the Hoar Cross Hunt. One diary entry from 12 March 1870 shows the hunt following an 11-mile trail for 1 hour 43 minutes, with the fox leading his pursuers from Derbyshire through south-east Staffordshire into Warwickshire, from Catton, on to Walton Wood, the towards Catton, then turned in the direction of Lullington, but on to Edingale, between Harlaston and Haselour, crossing the Midland Railway, to Elford and the wood between Elford Lowe and the river Tame, through the wood and crossing the meadows in the direction of Comberford, then for Wigginton Fields, recrossing the railway, passing Syerscote Manor and the Tamworth and Ashby turnpike road, the shrubberies at Amington Hall, turning south towards Tamworth, and crossing the railway again before the fox was killed in the open two or three fields from Tamworth station. A year later, Hugo was seriously injured in a hunting accident in February, and died tragically on 25 May 1871. 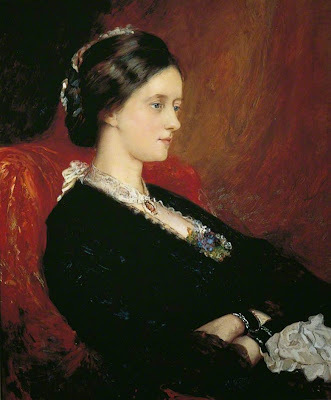 Following her husband’s death, Emily was reputed to be the richest heiress in England, but Hugo and Emily had no children. 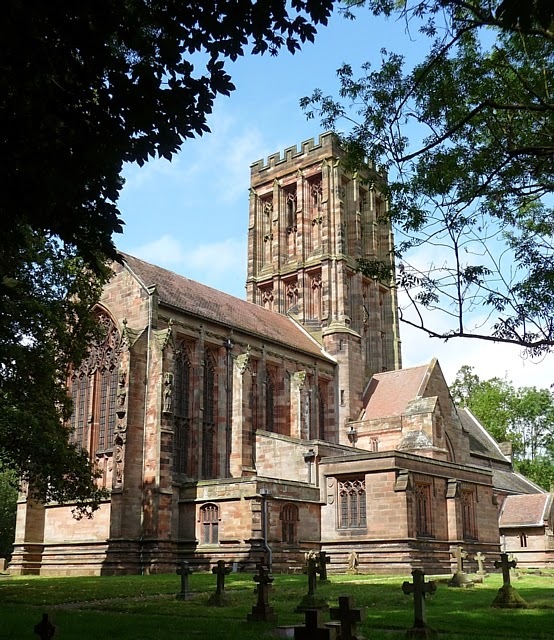 At first, Hugo was buried in Saint Peter’s Church, Yoxall. But Emily wanted a stately mausoleum for her husband, and set about building and rebuilding churches in his memory. Her first church was the Church of Holy Angels in Hoar Cross, a new building designed by the fashionable Gothic revival architects George Frederick Bodley (1827-1907) and Thomas Garner (1839-1906). She spared no money in building this memorial to her husband and virtually handed a blank cheque to Bodley. He was a pupil of George Gilbert Scott and his other churches include All Saints’ Church, Jesus Lane, Cambridge (1863-1870), Saint Michael’s Church, Brighton (1860-1861), and Saint Augustine’s Church, Pendlebury, near Manchester (1870). He had also completed the restoration of the chapel of Jesus College, Cambridge, which Pugin had left unfinished in the 1840s. Building work on the Church of Holy Angels began on 3 May 1872, and it was completed in 1876, at a final cost of £37,474. Earlier, the Eucharist was celebrated in the new church for first time by the Bishop of Lichfield, George Selwyn, on 25 January 1874, when the first Vicar, the Revd William Dunkerley, was instituted. Bishop Selwyn returned to dedicate the church at Choral Evensong on 22 April 1876. A few days later, Hugo’s body was removed from Saint Peter’s Church, Yoxall, and placed in the splendid tomb Emily had erected in the Chantry Chapel on the south side of the chancel. The building’s detail is remarkable and includes marble floors and intricately carved walls. The whole interior is sumptuous. The rib-vaulted chancel soars to a much greater height than the nave. Light flows in through large windows illuminating the stone carvings and statues, with angels and archangels, apostles, martyrs and bishops. The rood screen, with figures carven in Oberammergau, is as rich as Pugin’s in Cheadle. In the nave, the font has a towering wooden canopy. The reredos includes a crucifix that could easily have been inspired in its design and detail by the Bosworth Crucifix. The Stations of the Cross, considered by many as the outstanding decoration, were carved by two old woodworkers in Antwerp, DeWint and Boeck, and then coloured by Messrs. Powell using a technique Emily had admired in the Marienkirche at Danzig. The embroidery and vestments in the church include a chasuble said to have once belonged to Pope Gregory XI, who died in 1378. The second portrait, by Sir William Blake Richmond (1842-1921), was painted in 1884 when Emily was a widow and six years after she had completed the Church of the Holy Angels in Hoar Cross. It is in oil on canvas and measures 75.5 x 63.3 cm. It was a gift from Lord Halifax in 1948. It is also held by the Leeds Museums and Galleries and can be seen at Temple Newsam, Leeds. Richmond was a portrait painter and a designer of stained glass and mosaic. His works include mosaic decorations below the dome and in the apse of Saint Paul’s Cathedral, London. He was born in London and was named after William Blake, the poet and artist, who was a close friend of his father, George Richmond (1809-1896), also an artist. Richmond received some training from John Ruskin, and at the age of 14 he entered the Royal Academy schools in 1857. In 1878, he succeeded Ruskin as Slade Professor at Oxford University, and later became professor of painting at the Royal Academy. After completing Hoar Cross, Emily decided to restore Laughton Church in Lincolnshire and once again she turned to Bodley and Garner. The nave of the church was thoroughly restored and a new chancel was built in the Decorated style. The work of restoration was once again a memorial to Hugo and his effigy in white marble at the east end of the nave is a copy of his monument in the church at Hoar Cross. Her nephew and heir, Lord Halifax, later completed her restoration work at Laughton. Emily continued to make modifications to the church in Hoar Cross until she died at Temple Newsam on 21 December 1904. When she died, she was one of the richest women of independent means in England, with an income from investments alone that came to almost £168,000. However, no wealth or possessions ever compensated Emily for the loss of her husband. 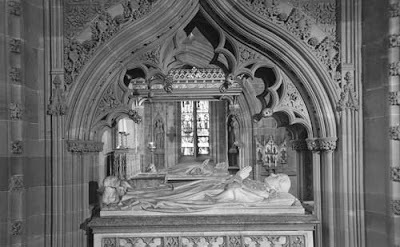 She and Hugo are buried side-by-side under marble figures in the Chantry Chapel on the south side of the Chancel in the Church of the Holy Angels in Hoar Cross. Hugo’s tomb is a recumbent figure in white alabaster in the uniform of the Staffordshire Yeomanry of which he was Commanding Officer. Over the tomb is a richly-carved stone canopy with figures of angels above it. The last Meynell to live at Hoar Cross Hall was Colonel Hugo Meynell. He moved to Newborough in 1952 and the hall stood empty for many years. In 1970, the hall was acquired by the Bickerton Jones family who restored much of the building and added several collections of armour. For a time, the hall was as a venue for mediaeval banquets and antiques fairs before it became a Health Spa Resort in 1991. Should the Church recover its role as a patron of the arts? Is your parish church a place of beauty and a place apart for the whole community? Is there someone you love so much that you would be inconsolable when they die? How do you expect to be remembered after your death ... and for how long? Does human love survive human death? And how? How do we express the hope that those we love and are dead are caught up in God’s eternal love? Do the Crucifixion and the Resurrection teach us something about the death of those we love? How are the sorrow of death and the hope of new life in Christ caught up in the celebration of the Eucharist? How can Lent be lived as a time of absence and preparation for new life in Christ? If we only hold what we possess by grace and not by right, and hold it only in custody, how can we use it for the greater love of God, yet provide for those in need and those we love? Tomorrow: ‘40 days’ (2014) by Angela Wright, Southwark Cathedral.